What’s a Smurf? asked Son of Mine. Is is it an animal? Son, much to learn you have. Let me take you down to the Build a Bear Workshop and we’ll find out for ourselves. 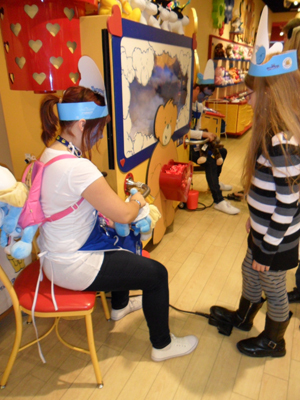 Though this cuddly toy emporium is best known for its teddy bears, it’s also home to dogs, owls, dinosaurs and for a limited time only – The Smurfs. Though you couldn’t get a more welcoming host than Hayley, and I do think that beard suits her very well. 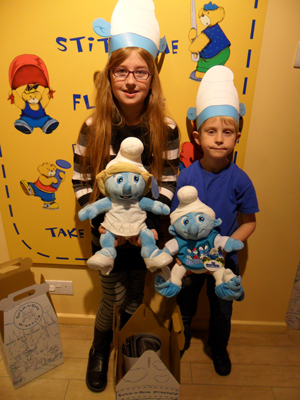 So, Son of Mine made a Boy Smurf, whilst Daughter of Mine created her own Smurfette. The Build a Bear way is that you start off with the outer skin, then add noises, stuffing and clothing to create your own unique toy. And as we inserted hearts in our Smurfs, I loved that you had to rub the heart on your nose to make a nosy Smurf, on your forehead to make a brainy Smurf and on your cheek to make a cheeky Smurf. So it’s a very different experience to simply going in and buying a toy off the shelf. 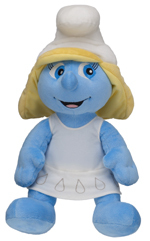 As guests of BAB we didn’t pay for our Smurfs, but what I’ve found when we’ve bought stuff from there before is that they become the cuddly toy classics of the house. They’ve got so much personality that children can’t help but bond with them from the start. And when our BAB Bunny started coming apart at the seams after three years of enthusiastic cuddles, the staff were happy to repair it free of charge. Whilst they can be pricier than other teddies (though not necessarily – prices start at £9 for a 36cm bear), I do think that you get a lot more for your money since the mere process of shopping for a toy is turned into an experience to remember. 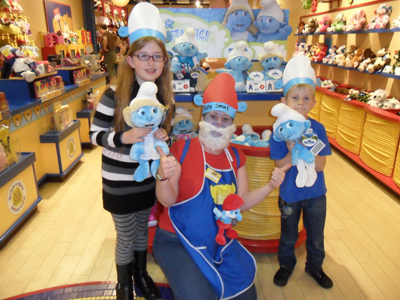 The Smurfs are in store now at all Build a Bear stores and online here, priced £18, with accessories from £4.50. The Smurfs movie opens in the UK on the 10th August. I think I’m going to need two extra tickets.